City Lit, in London, is running a five-week course called Anthropology of the Paranormal this summer. The course uses an anthropological approach to paranormal beliefs in contemporary European and American societies - including ghosts, psychic powers, UFOs and monsters - to examine the cultural meanings of these modern types of folklore. The lessons are on Mondays from 1pm to 3pm, starting on 20 July 2015 and finishing on 17 August. 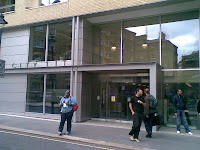 They take place at City Lit, Keeley Street, Covent Garden, Camden, London WC2B 4BA. For more details, visit: http://www.citylit.ac.uk/courses/anthropology-of-the-paranormal or call 020 7831 7831 to enrol.